Sparklines are small charts that fit inside individual cells in a sheet. Because of their condensed size, sparklines can reveal patterns in large data sets in a concise and highly visual way. Use sparklines to show trends in a series of values, such as seasonal increases or decreases, economic cycles, or to highlight maximum and minimum values. A sparkline has the greatest effect when it's positioned near the data that it represents. To create sparklines, you must select the data range that you want to analyze, and then select where you want to put the sparklines. Select the data range for the sparklines. On the Insert tab, select Sparklines, and select the kind of sparkline that you want. In the Insert Sparklines dialog box, notice that the first box is already filled based on your selection in step 1. On the sheet, select the cell or the range of cells where you want to put the sparklines. Important: When you select this area, make sure that you select dimensions that are suitable for the data range. Otherwise, Excel displays errors to indicate that the ranges are not consistent. For example, if the data range has three columns and one row, you should select an adjacent column and the same row. 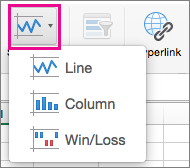 Tip: When you change the data on the sheet, sparklines update automatically. You can distinguish specific data points, such as high or low values, by using markers. For example, you can mark the high or low point in a sparkline. Click one or more sparklines. On the Sparkline Design tab, select the markers that you want. You can also select the marker color. On the Sparkline Design tab, select the style that you want. Tip: To immediately undo a style that you applied, press + Z . 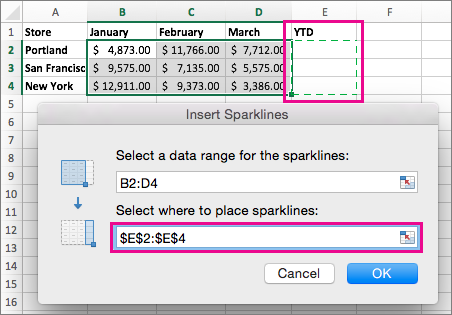 On the Sparkline Design tab, select Edit Data, point to Hidden and Empty Cells, and then select the option that you want. Click the sparkline that you want to delete. On the Sparkline Design tab, click the drop down arrow on the Clear button, and then select the option that you want.